Just when we started to think Antonio Cairoli was going to walk away with the 2019 MXGP championship and join Stefan Everts at the very top of the motocross tree, Tim Gajser turned up and wrote another chapter in his own story. Going 1-1-1 in Trentino, being the fastest guy all weekend, and showing not only amazing calm, but also incredible nerve, the HRC rider captured not only the hearts of his beloved countrymen but a big section of the Italian crowd. So is the 2015 and 2016 World champion looking for that incredible third World title—something very few men have done in the sport—and can he move into the all-time GP winners top 25 as he again shows he is a GP winner? 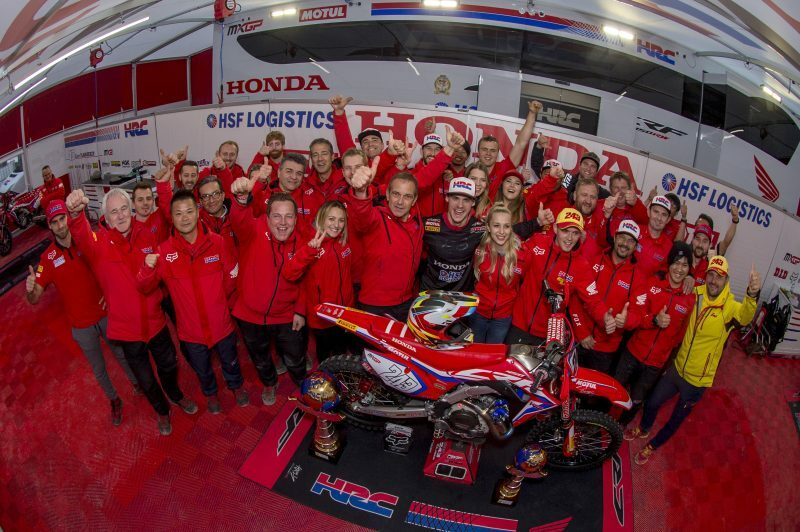 Maybe, just maybe it is Tim Gajser who is looking to break records. And maybe it is Cairoli and Jeffrey Herlings who just have to wait. We caught up with him today and asked him about his weekend and what to expect in the coming months. Tim and his HRC Honda team desperately needed this win. Firstly congratulations. With Jeffrey not racing many of us thought Antonio would just control everyone, but you have really come back to the very best Tim Gajser, in fact riding better than ever probably? I mean, it was incredible. I felt good on Saturday and then Sunday again, and I was enjoying it, and these types of tracks when you have to be careful on the gas and make really smooth lines. In the first moto I didn’t have the best start, so first lap I passed three guys in front of me and I was behind Tony. We were close all moto and I didn’t want to rush and pass him, and I knew he would be strong at the end of the moto, so I just followed him and make a pass late in the race, which is what I did, but when I passed him, he pushed really hard and our level was very high. In the second moto I had a better start and I was in his position from the first moto, with him following me. He then passed me, and I passed him back and then he passed me again. He then made a mistake and the pace was really high, we were both pushing a lot, but from my side I was still in control, because it was so easy to make a mistake on this track, because it was sketchy. To eventually win, in front of so many amazing fans, it was really special. You mentioned when you finished that it was a cat and mouse race and amazingly watching it, you could see that, as you watched Tony’s lines and then he would watch your lines. When you passed him in that second race you could see you started using some of his lines, instead of the lines you used earlier in the race, when he was faster than you. How enjoyable was that aspect of the race? It was really enjoyable, and I think everyone enjoyed it. We battled on the track and everyone around saw that. It was really tough mentally, but I knew it was important to stay focused before the race. Like you said, I didn’t let him pass me, but when he did I just thought, okay, go ahead and I can see where you are faster, I knew I had my section where I was faster and I knew he was faster in some sections, because I could suddenly hear his engine was closer and I tried to change lines in those sections he was faster, but once he passed me and I could see where he was faster, then I changed some lines and tried different options, because following is easier. I was a nice battle until the end. The two things that impressed many people the most about your weekend, was how smooth you looked and your mental strength. At times I had to think you looked like Stefan Everts, just sitting up and cruising around and looking really calm, and the pressure you were under and you stayed in control, that was really impressive. Yes, like I said, I tried to stay calm and focused the whole race. It was really a tough race mentally, because concentration was so important and a couple of corners you have nice ruts, but some were just completely flat and no traction or grip and you really needed to control the throttle and we crossed the finished line and it was a great feeling. 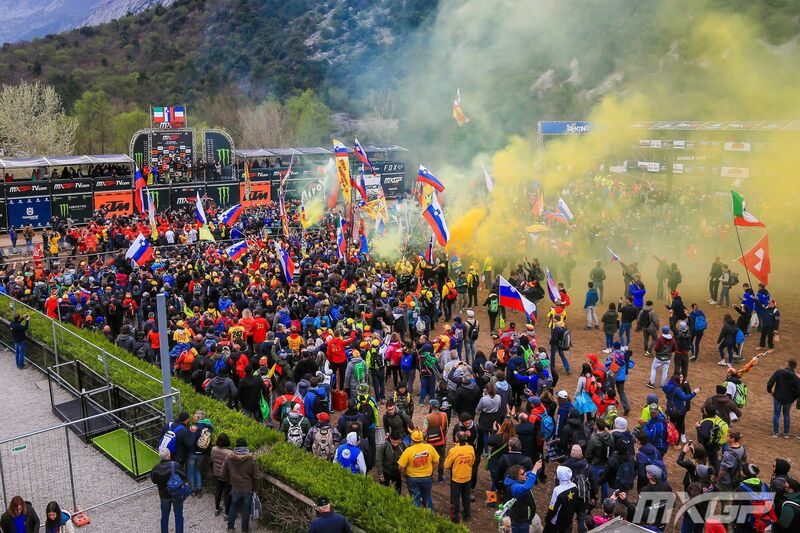 The scene at the MXGP of Trentino podium was incredible. I mentioned it to you before, but Roger Harvey told me in the pre-season how good you looked, and I saw it in Argentina. You look so focused, but still, you made those bad errors in the first three GP, and this time, you were able to keep control and it was Tony who made the big mistakes. It was a very important change in the championship, wasn’t it? Yes, I agree. The first three GPs I had a least one big crash, in Argentina, in Matterley and Valkenswaard, and I tried to learn as much as possible. I really tried to learn as much as possible to stop this type of mistakes happening and I was really disappointed twice in a row the same type of mistake and I just needed to concentrate even more. It paid off, and it was amazing to have a perfect weekend, fastest in all the timed practice, fastest in the warm-up, winning three motos, it was great. Doing that in Arco, where the atmosphere was really a high level, with all my fans there. It was special for me. It is clear you love the place; you beat Jeffrey straight up for your first GP win, and Antonio straight up last weekend. So, you have beaten two of the greatest riders ever at that place. Sure, I mean I am happy at the moment where we are and the bike is working amazing the setup and the team, and everyone around me. It feels like we are in the right place and motivation now is even harder, because everything is going the right way and I can’t wait for Mantova. That is my last question. Mantova, you and Tony had that amazing battle in 2016, then we have Portugal, and St Jean in France. Tell me what you think of those three tracks? I can’t wait. I like Mantova, I like Portugal and also St Jean. Three completely different ground, Mantova sand, Agueda is red clay, and hard pack with stones in France, yes, I am excited for these three races and I will try and prepare myself as well as possible.